Spring trout fishing around Central New York continues to be very good. Temperatures have been holding pretty stable on most streams, hovering and swaying somewhere in high 50’s to low 60’s. Water flows are a little on the low side, but not bad. Bug activity and hatches increase on a daily basis and the trout are looking up! And, while Mike and I have been busy taking advantage of the fantastic trout fishing locally, there lies another, and very different, fishery a 4 1/2 – 5 1/2 hour drive to our east. This is Striper fishing. Striped Bass eat ferociously and are eager to take a fly or plug with savage aggression. It’s this ferocity and extreme predator behavior, coupled with the muscular body that can make an 18″ fish feel like a 30″ fish, that draws me to chase these Linesiders. This is a slight change of pace from the cold water and warm water fishing we talk about so much here, in Central New York. And by slight, of course, I am exaggerating significantly. Striper fishing is a different animal. Each Spring, these fish migrate north, running the Atlantic coastline from their wintering grounds to the south. Along the way, Stripers spawn up rivers, such as the Hudson and its tributaries, and then continue their migration north through New England and into Maine, as far north as Nova Scotia. How far they move north depends on many things, but invariably, water temperature and bait are two major determining factors for their northern migration ranges. 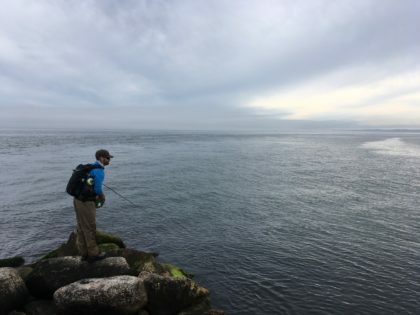 Then, each fall, as the water temperature cools and bait moves south, the Stripers follow suit and begin their fall run back to the winter areas. This is my brother, Brandon, with a very nice schoolie sized Striper. A quick note here… I have used the term “schoolie” a few times now and feel that I should inform those of you who may be new to Striped Bass fishing what exactly “schoolie” refers to. “Schoolie” refers to the size of the fish. Stripers are, often times, a school fish in smaller sizes. Anything less than about 28″-30″ I consider schoolie size. Above this mark, I consider them keeper to breeder size, as they generally need to be over 28″ inches to keep. Please, check the local regulations before you harvest fish, because the do vary slightly state to state! This is Brandon casting and stripping line off a jetty and waiting for the tug. This is what keeps me going back. Seeing big fish refuse a fly makes me want to fish more and work harder to catch said fish! Their instinct is to crush baitfish and your fly, which hopefully looks like what they’re eating. Couple that instinct with the power of their vicious takes and you’ve got yourself an addiction. This vicious take, of course, is only after you “match the hatch”, play the tides right and figure out what tides they are eating on, figure out what slot they are feeding in, what slot they are moving through, what depths are they eating in, and how they want the fly presented. Whew… out of breath! Stripping line, hand over hand, puts the angler in direct contact with the fly and allows you to feel that mean take while stripping line. Always strip set! Then, the battle is on. After the fish annihilates your fly, the ferocious head shakes ensue. And, that fish is smart. Don’t think for a second that it doesn’t know where every boulder and snag is. That fish knows where the piling is to wrap you around. It knows to use the current and outgoing tide to peel line off your reel that makes you hope it’s a fish of a lifetime. Is it a 20″ schoolie that knows what its doing? Or is it the 36″ trophy you’ve been waiting to get a picture of for years? Thanks for reading! Keep the rods bent and lines tight! A little side note… If Striper fishing sounds interesting to you and a wade trip to Cape Cod for a weekend or long weekend sounds like a good time, let us know and stay tuned as Mike and I explore the possibility of offering wade Striper fishing trips in the Fall or next Spring!